Sister Catherine serves as Executive Vice President of Sponsorship and Governance at Trinity Health Systems in Livonia, Michigan, where she has ministered for 29 years. She holds a bachelor’s degree in music from Siena Heights and a master’s degree in music education from the University of Michigan, but much of her ministerial life has been spent in leadership and health care. After serving as musician and high school music teacher, Sister Catherine was appointed as Co-Provincial Superior in the Detroit area. After that she served as administrative secretary and then assistant director of the Leadership Conference of Women Religious (LCWR). Recognizing her leadership skills, delegates at two General Chapters – 1978 and 1982 – elected her as Administrator on the Congregation’s General Council. In 1987, she began her health care ministry as assistant to the President of Mercy Health Services in Detroit, which later – with Sister Catherine’s assistance – evolved into Trinity Health. In her current role, she has developed a formation program for lay leaders, helping them to understand their roles in the mission of Catholic health care. Sister Sharon McGuire devoted her life to teaching, nursing, advocating for social justice, and scholarly writing. After receiving her bachelor’s degree in English from Siena Heights and teaching at the elementary level, she earned a master’s degree in physical education from Wayne State University. She began to focus on ministering to migrants and immigrants as a community organizer and fundraiser at the United Farm Workers Center in Keene, California, and later ministered with migrant farm workers in Florida. Realizing the migrants’ need for health care, she earned a Bachelor of Science degree in Nursing. Her ministry took her to the Colorado Migrant Health Program, where she served as a community health nurse, and to the San Vicente Family Health Center in El Paso as a nurse practitioner. Sister Sharon then returned to the ministry of education, coordinating the newly established community health nursing major at the University of Texas at El Paso. 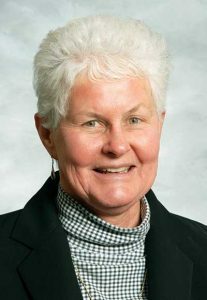 After earning her PhD in nursing from the University of San Diego, she returned to Siena Heights in 2008 to serve as consultant and faculty member of the University’s new Nursing Department. While still living in Adrian, she also taught in the Nursing Education online program at Walden University in Minneapolis. During this time, Sister Sharon wrote numerous scholarly articles and chapters in nursing textbooks. She died on May 17, 2016. Also receiving awards were Amy Wertenberger, a licensed professional counselor specializing in equine assisted counseling, Recent Graduate Award; Patty Driscoll-Shaw, a nurse who has advocated for the poor and oppressed, particularly in Latin America, the Sister Ann Joaquim Award; Katie Guilbault Decker, who, as principal, transformed an inner-city Las Vegas school into the best in the state, St. Dominic Award; and Dr. Louis Vaccaro, president of Siena Heights from 1978 to 1983, Honorary Alumni Award. Siena Heights University’s Homecoming Weekend also included an art welcome reception and gallery opening; a ground-breaking ceremony for the new Spencer Performing Arts Center; evening productions of The Addams Family: A New Musical; Siena Heights Saints football against St. Francis University, Indiana; an alumni reunion and dinner; Homecoming Mass; and concluding brunch.